Belgians have staged a series of tongue-in-cheek events to mark what many there see as a new record - the world's longest wait for a government. Belgium has been without a government for 249 days - longer than Iraq - as parties from the Dutch-speaking north and French-speaking south remain split. Students took to the streets, with the promise of free beer and chips, and dozens stripped to their underwear. 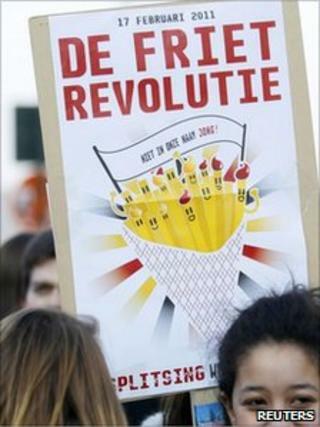 The day was named "chips revolution", after Belgium's renowned national dish. Organisers hoped the events would boost efforts to break the political impasse. "We've had enough of political games," Kliment Kostadinov, one of the event's organisers, told AFP. "We must get a government fast and a reform of our institutions that is good for all Belgians." Johan Vande Lanotte, who resigned recently from the post of king's mediator with the task of ending the crisis, urged Belgium's political leaders not to give up on finding a solution. He told Belgian radio that he had achieved agreement on up to 70% of his text but the final step had proved difficult. "If the gap is so great, the parties should take great steps. That is not easy. Often they don't realise how hard that is. You don't make major reform of the state without enormous pain in your own ranks," Mr Lanotte said. In a speech later in Ghent, he set out proposals for a Belgian union made up of four separate parts - Dutch-speaking Flanders, French-speaking Wallonia, the capital Brussels and German-speaking areas. A caretaker government has been running Belgium since last June's elections which failed to produce an outright winner. Although it took 249 days before Iraq achieved an outline agreement on a government, approval was not forthcoming for another 40 days, and some have questioned whether Belgium has yet broken the dubious record. But that did not stop dozens of student organisations marking the event under an umbrella group entitled "Not in our name". Around 1,000 students and schoolchildren took part in an event in Brussels. A similar number took part in Louvain-la-Neuve, where the organisers handed out 300 portions of free chips with mayonnaise, a staple part of the Belgian diet. And in Ghent, where activists said 249 people would protest naked to mark each day of political paralysis, dozens stripped to their underwear. Actress Marijke Pinoy was asked by De Standaard newspaper why they were taking off their clothes. "Why? Because if we're naked, we're all people together," she said. Although many of the events appeared light-hearted, organisers insisted they had a serious political message of conserving social security and strengthening solidarity.